On my computer I find using Adblock plus a handy way to speed up surfing and hide invasive pop-up ads. Annoyingly you can’t install Adblock on an iPad without jailbreaking it – and I’ve yet to come across a way of installing it on Android devices easily without requiring root access. Fortunately there’s an easy way to install Privoxy on a Raspberry Pi that can block adverts (and do a few other things as well) and that works seamlessly on iOS and more or less anything you attach to your network. You could run this software on any PC attached to your network – but with the Pi’s low power consumption (3.5 watts) you can afford to leave it on all the time. Plus you could combine this functionality with a fileserver or an airplay speaker for a bit of extra usefulness. First step is to prepare an SD card for your Pi – I’ve been using the default Raspbian. Make sure you change the default Pi password, and enable SSH in the menu. 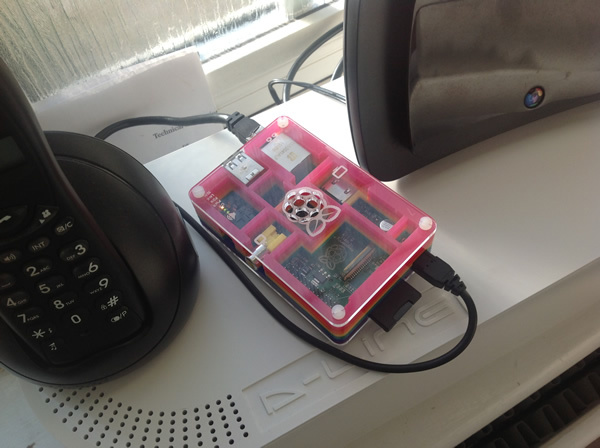 We’ll be using SSH to control the Pi remotely. Next you can connect to your Pi using an SSH client – I’ve been using Remoter Fusion on the iPad (other SSH apps are available but I was using Remoter for something else) note that you will need to purchase SSH support in app which adds £5 to it’s price. To connect to your Raspberry Pi with Remoter Fusion, click on discovery list -> Add Session Manually. On the Server Type choose SSH. In the box that says SSH Hostname enter your Pi’s IP address which you found out above: 192.168.1.number then choose Manual – leave the SSH Port setting at 22 and in SSH Username enter your Pi username and SSH Password your Pi password. Then connect – you might get a warning message (just accept) and then you should be seeing the Linux prompt. this launches nano which is a basic text editor – the following settings will depend on your Router – most routers will have a configuration page which will give you this information if you visit their configuration page – usually found on your network by typing 192.168.1.1 into a browser. The following settings worked for the BT Homehub version 3. Press control and O and then enter to save, followed by control and X to exit. You might want to test your settings – either by using the Ping command, or by attaching a monitor / keyboard / mouse directly to the Pi and firing up the web-browser – the Pi should be able to connect to the internet. Control O to save in nano then control X to exit. Now on your iPad go to settings -> Wi-Fi -> your network name and then scroll to the HTTP proxy options. Choose Manual and where it says Server type your Pi’s IP address: 192.168.1.number and where it says port type 8118. Finally go to config.privoxy.org and if it’s all working correctly you should see an enabled message. You can take this a bit further by turning your Pi into a personal VPN for secure browsing on the go with this Lifehacker tutorial. Probably an overkill using a Pi for this, but it is handy being able to work on the Pi using an iPad and as I mentioned before there are a few other useful things your Pi could be doing at the same time. Thanks! – I’ll check – but in the meantime have you tried using the bookmarklet option? http://www.privoxy.org/user-manual/appendix.html#BOOKMARKLETS I’ve noticed some youtube videos work fine, others are blocked. Hi Maze W, I get the same thing with the out of the box functionality of Provoxy. I’ll post back here when I work out how to configure the actions file…. thx, I’ll try the bookmarklet for youtube. I’m still looking for the domains to unblock for imessage. @Pete @Ted Tofield Looking forward to whatever you find out! I also found another adblock solution for ios that’s worth checking out. At http://iosadblock.webs.com, there are instructions on how you can block all Advertisements everywhere, in all of your apps, and in mobile safari. Thats pretty nice and EXACTLY what i am looking for (because i want to buy a pi), but one question, is there a possibility to FORCE every Computer in MY NETWORK to use this Proxy? Because some of my friends have an ipad too and they looking astonished when they see i have no ads in my ipad but they have, and i don’t wanna show them to always shut on / shut off the proxy. Hot Tip: set the listen-address in /etc/privoxy/config to 0.0.0.0 (instead of 192.168.1.number). This means that privoxy listens on ALL network interfaces (including the loopback interface). Pingback: » Apple:What options exist for ad free web browsing on iOS?